Le Marche des Pays de l'Aveyron a region in Midi-Pyrenees near Tarn et Garonne. 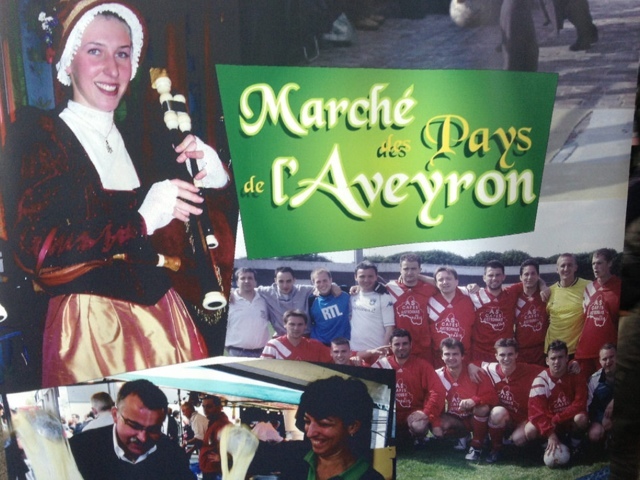 "Tasting is obligatory" is the rule of the day with the Aveyronnais. 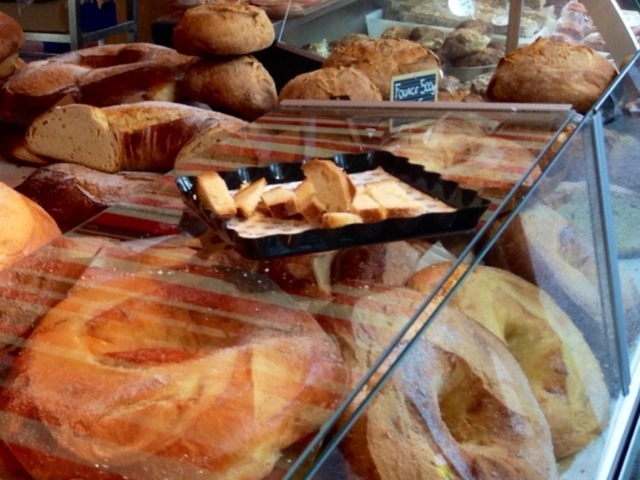 FYI many of Paris' cafes owners are from the Aveyron department including the hugely successful les Freres Costes. 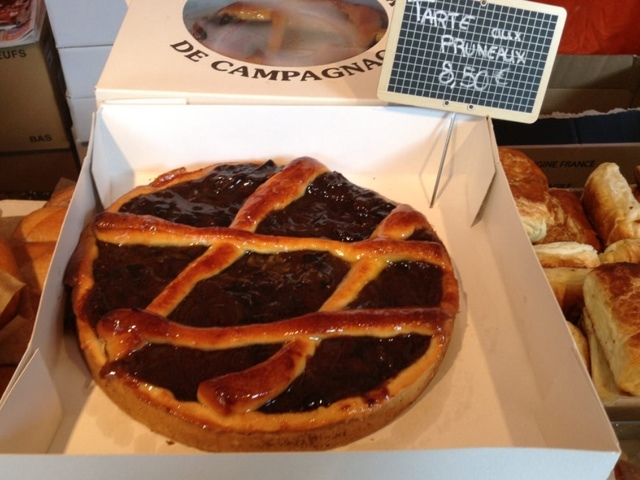 The brioche-based cakes are wonderfully light and filled with prune preserves from Agen. These hearty brioche cakes are called 'fouace' or fougace.. So the end result is a christmas tree-shape of multiple layers of crust. Delicious! The hams are deeply flavorful. 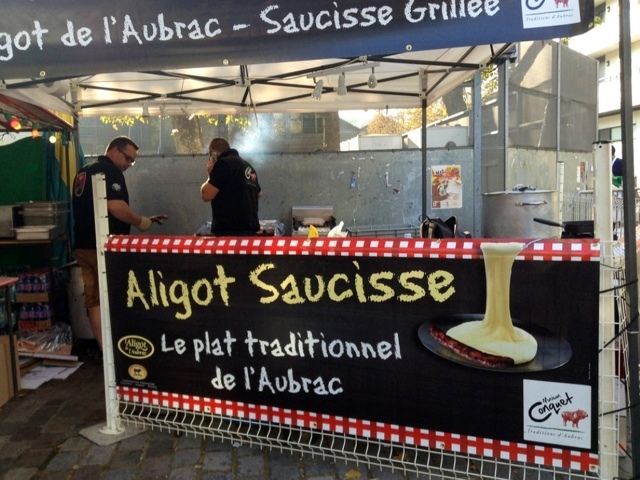 Lunch on offer is a hot bowl of Aligot (made from mashed potatoes, Tomme cheese, garlic) plus local sausages. 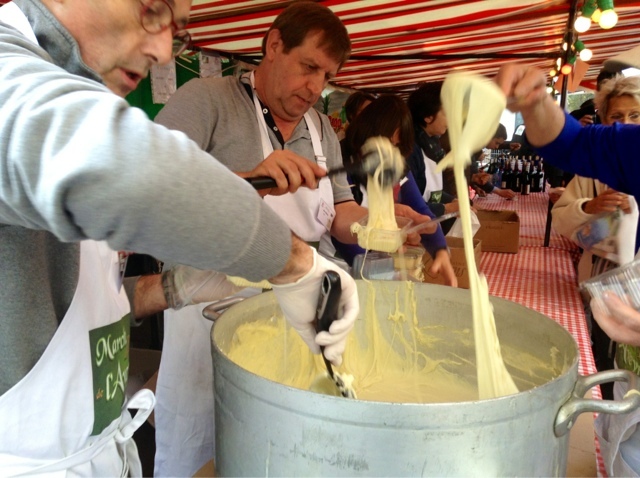 Aligot being stirred and dished out. Not an easy job since Its tremendously sticky and stringy. Not easy to eat either but intensely garlicky. I was admiring the walnut oil. 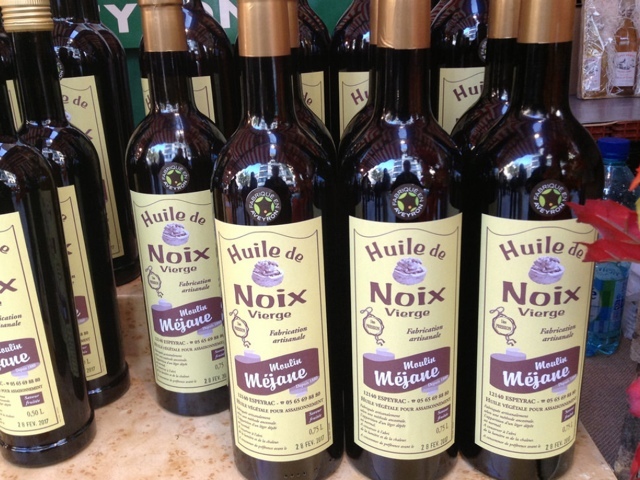 But Chef Marthe cautioned buy only a tiny bottle. It can go off fast. We bought fresh walnuts instead. 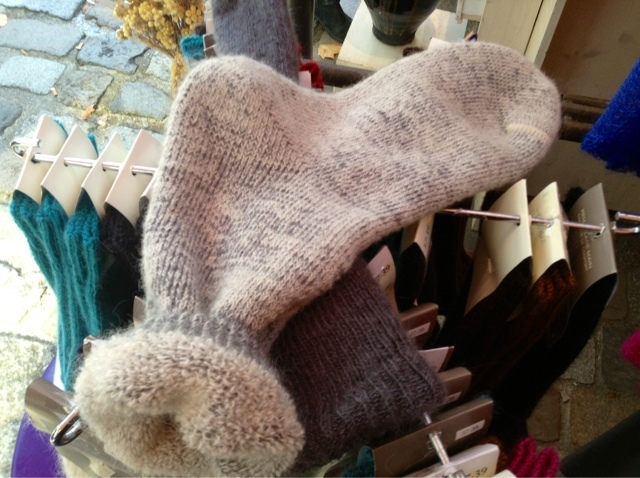 From these sheep come wonderfully toasty socks. 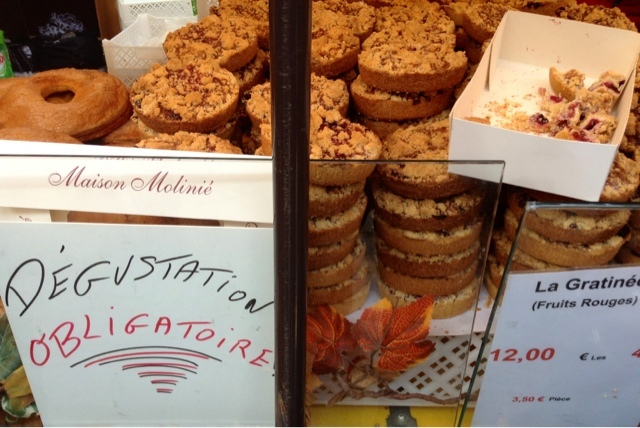 I will have to visit Aveyron and get them. Je regret beaucoup. 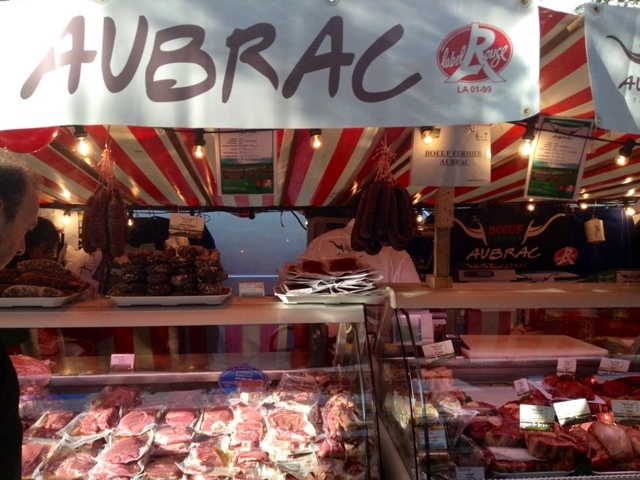 Marthe told me of the fabulous, tender beef from Aubrac bulls, a must-buy from Maison Conquet. Its so tender you don't need a knife to cut it. This enormous Saint Bernard showed up, hoping in vain someone would throw him a giant bone or side of boeuf. 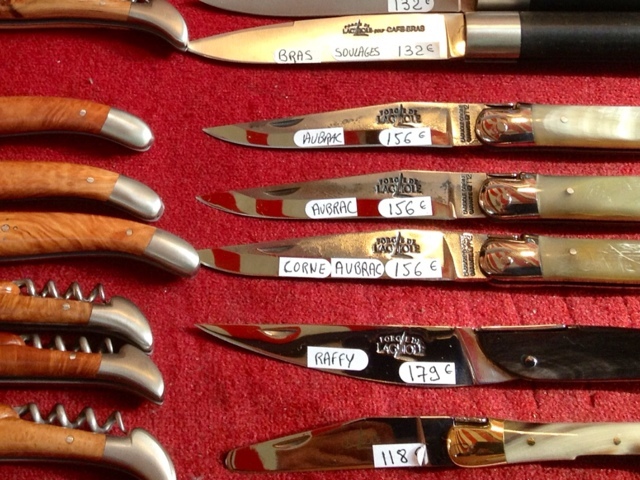 Interesting to note some of the sharpest knives in France come from Laguiole in Aveyron. I came home laden with Roquefort, prune cake, entrecote steak and walnuts. 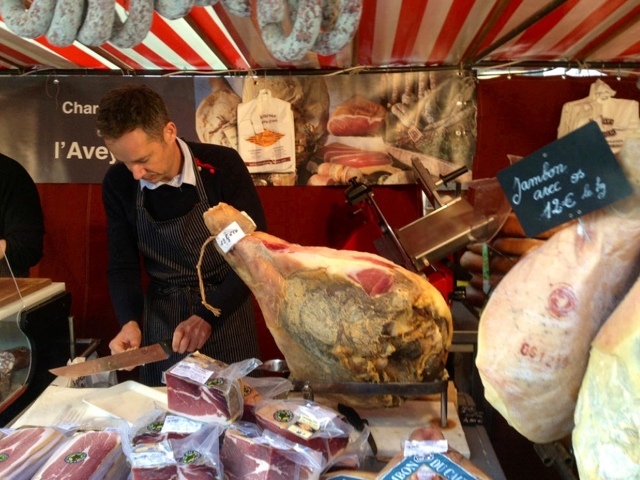 Aveyron producteurs come back to Paris for the Noel season at Les Salon des Coqs d'Or, Salon Saveurs and Salon l'Agriculture. Please come back sheep sock lady et mille merci Chef Marthe!! Chef Marthe..such a pretty smile! 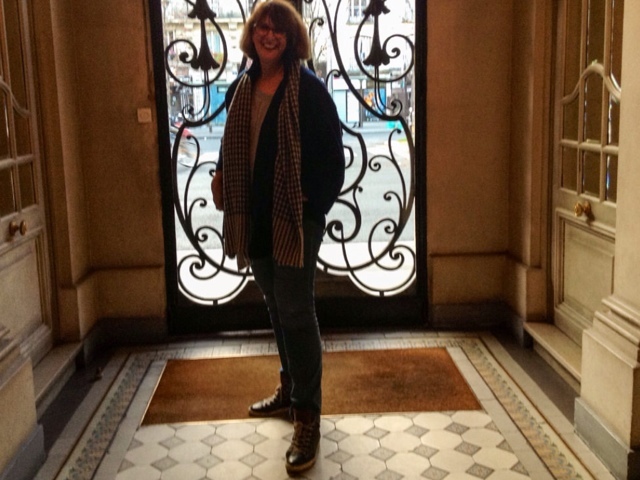 Is that the entrance to your building? Beau!! That gratinée aux fruits rouges..miam.. Very much like some entrances I have seen in French movies. Food glorious food straight from the farmers. 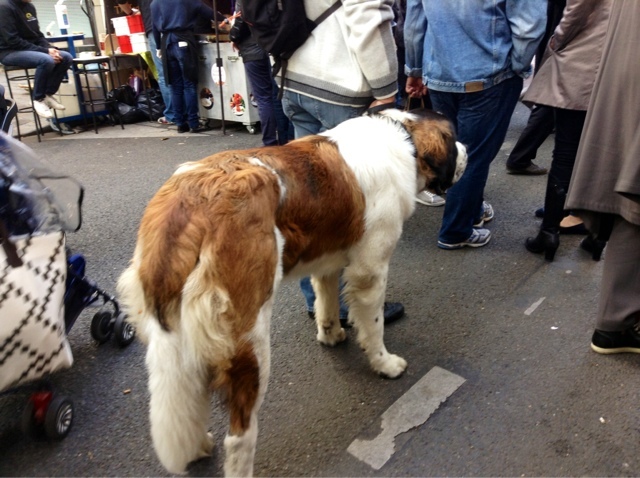 So rare to see a BIG dog in Paris! 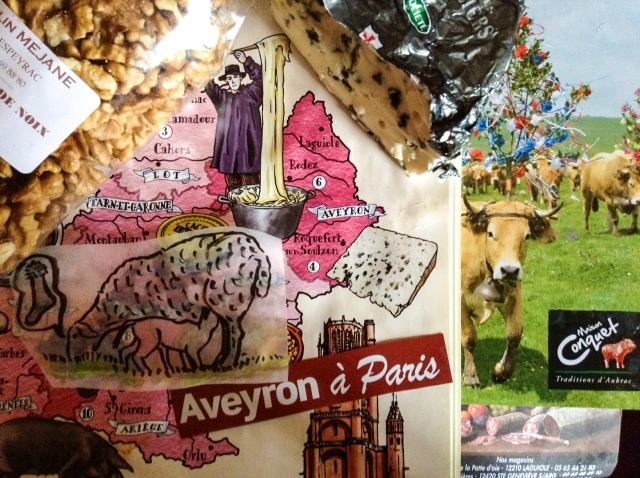 Maybe he came in from the country...Aveyron? Always love fetes/exhibitions like this, like you I see something I like, hesitate and up not buying then regret it when I get home. Those socks would be so toasty. oh well never mind, you'll have to wear two pair at the same time. 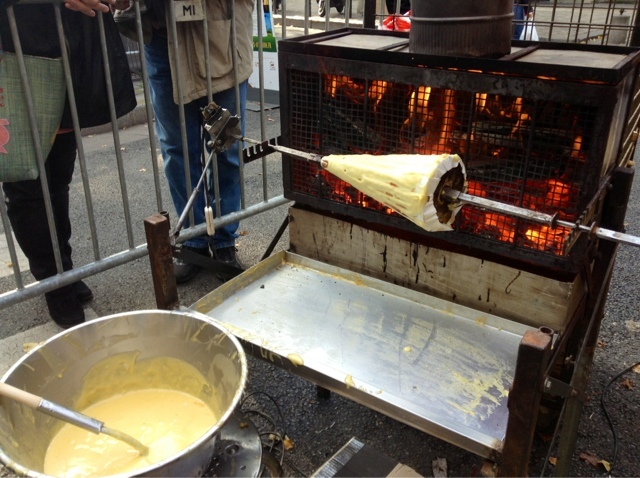 Yuummmm Miam : Aligot ! 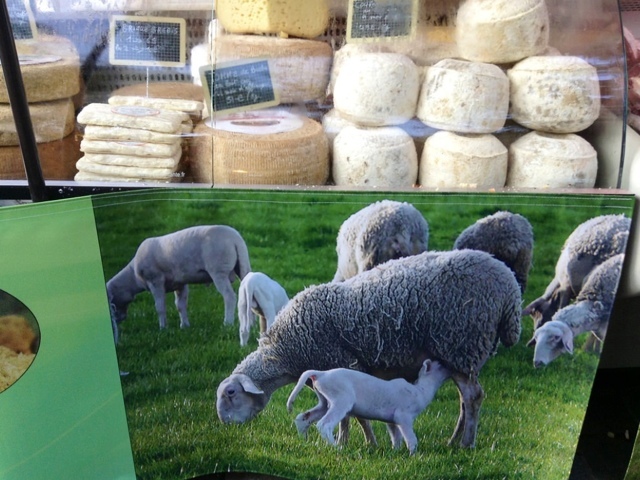 I live now (I was Parisian) near Aveyron, in Cantal, and I like very much to eat aligot ! Thank you Carol ! Ahhh...You dream of New York Nathanaelle! While I dream of Paris..
Self control can result in so many regrets....may you and your soul-mate socks be reunited soon! I think the soul-mate socks will be at one of the Noel events!! Like Sherlock Holmes I am now on a mission! True I found wonderfully warm socks whilst in chilly Amiens at the chain DAMART. They number their hot stuff 1-5. I bot #4 socks 2 pairs. Some peep are greedy for warm socks and can't get enough. I will do a DAMART Report this week!! FYI: DAMART makes Thermalactal clothing Like Lands End but maybe warmer!! You do have the BEST TIME, it just makes me happy to see all the fun adventures you are having! 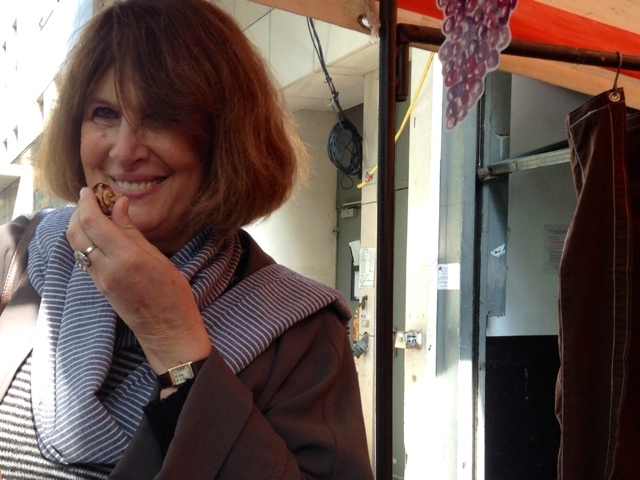 You make me daydream about how different my life might have been if I had stayed in France! Have Fun! I love receiving your post with my morning Coffee! It's never too late Ann. Paris is waiting for you!! Carol, this event looks surely does look like a whole bunch of fun! 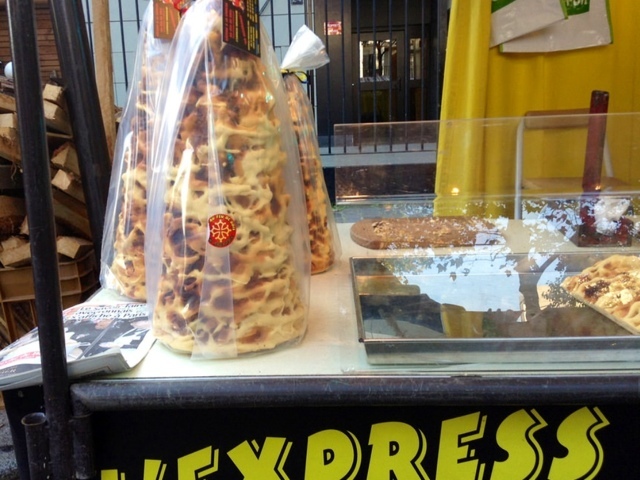 That Christmas tree pastry formed on a spit is rather wonderful! Well, actually, everything that you've shown us here is rather wonderful. To true Frances. I wanted to buy everything. And yr buying from the maker. The Best. Thank you for reporting this! I was there too, just by happenstance. 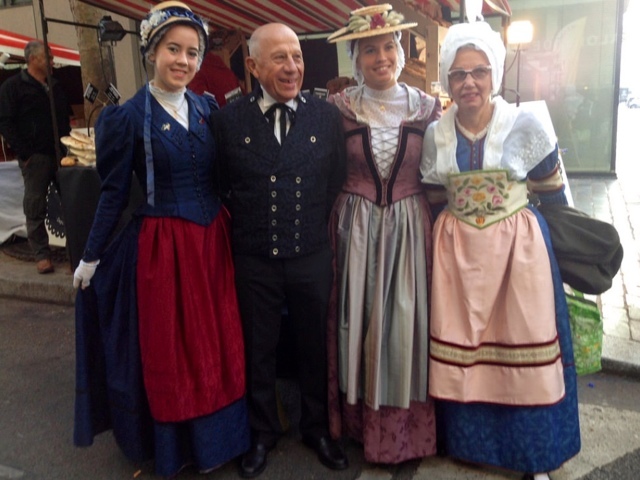 I was discovering that wonderful Bercy park and followed my ears and nose and stumbled onto this truly great fair! Lots of fun! So glad you enjoyed it too Julie! Bravo Carol c'est très bien vu ! You have so much fun & we get to live vicariously through you. Thanks, Carol. I'd love to hit one of those fetes next time I'm there. its hard work having fun! Next visit check the PB archive for the month you will be here. these things occur annually always around the same weekends Suki. This was a fun post. Don't you hate it when you pass up a buy only to regret it? I hope the sock lady shows up at a upcoming market for you. And, what fun to have a chef along too. Having a chef along is paramount!! I almost made the tragic error of buying hazelnuts instead of WALNUTS. One of my husband's most prized possessions is a laguiole pocket knife made from antler that I got for him about 20 years ago in France.